Russian Foreign Minister Sergei Lavrov warned Western and Arab nations on Wednesday against arming Syrian President Bashar al-Assad's foes, saying it would lead to more bloodshed and would not enable the opposition to defeat government forces. The "Friends of Syria" group of Western and Arab nations is undermining international envoy Kofi Annan's efforts to end the bloodshed in Syria, Russian news agencies quoted Lavrov as saying. "Everyone has supported Kofi Annan's plan but decisions at the "Friends of Syria" group meeting aimed at arming the opposition and at news sanctions undermine peace efforts," state-run Itar-Tass quoted Lavrov as saying. Western and Arab nations said after a "Friends of Syria" meeting on Sunday that the group would consider further "measures with a view to the protection of the Syrian people." Loud explosions reverberated across the central Syrian city of Homs on Wednesday, just hours after the government said it has started to withdraw troops from some cities in compliance with an international cease-fire plan. 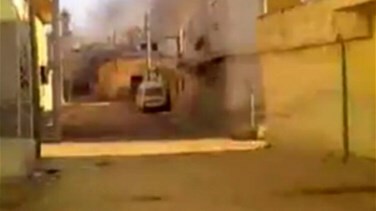 Wednesday's explosions came as dramatic amateur video was released showing a fire engulfing what appeared to be a Homs mosque on Tuesday. Activists claim the fire was caused by a Syrian forces attack on the Dar al-Salam mosque in the al-Qarabees neighborhood. Opposition activists claimed on Tuesday that the regime was racing to crush opponents ahead of the cease-fire deadline by carrying out intense raids, arrests and shelling. However, a Syrian government official said Tuesday evening that troops had started pulling out from some calm cities and heading back to their bases, a week ahead of a deadline to implement UN-Arab League envoy Kofi Annan's truce plan.